Experience the Thrill of Kayaking in Costa Rica! From surfing to paddle boarding to snorkeling to waterfall rappelling, there is no shortage of water sports in Costa Rica! One of the most popular water sports in Costa Rica is kayaking. Costa Rica offers some incredible kayaking destinations and kayaking tours. You can kayak underneath a volcano on Lake Arenal, take a sea kayaking tour in Guanacaste and get your adrenaline pumping kayaking down the Pacuare River. Maybe a nature-focused kayak tour is your priority? Kayak along the mangrove trees in Tortuguero while you watch out for crocodiles, turtles and some incredible flora and fauna. 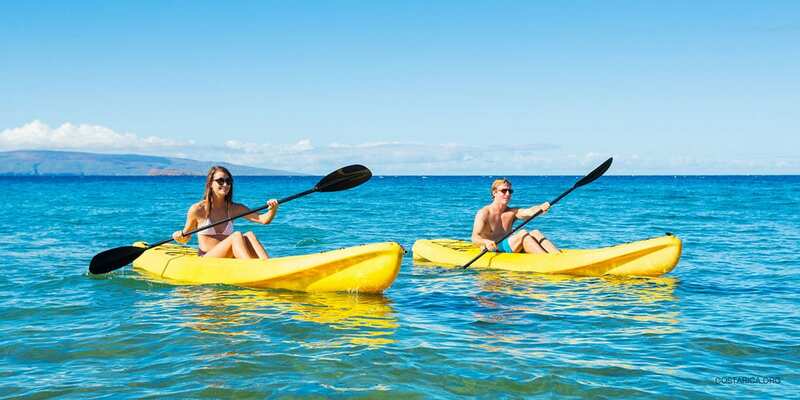 Whether you want to kayak on the sea along the Pacific coast, down the Tamarindo estuary or over the rapids of the Pacuare river, you’re guaranteed to find the best kayaking tours for you and your family in Costa Rica. Keep reading to learn about some of the best kayaking spots in Costa Rica! If a kayaking adventure is your focus, head to the Nicoya Peninsula for the Curu Sea Kayaking Tour. You’ll camp on a white sand beach after a day navigating the coastline in your kayak. Watch out for beautiful marine life swimming around you! Sea turtles and tropical fish will keep you company on one of the best sea kayaking tours in Costa Rica. The tour is 4 days and 3 nights and is meant for experienced kayakers looking to lose themselves in the jungle! The calm waters of Lake Arenal are a perfect place for beginning kayakers to learn the ropes. Even advanced kayakers will enjoy themselves on Lake Arenal. This massive, man-make lake sits below the Arenal Volcano and is surrounded by the Arenal Volcano National Park. That means the views are incredible! You can access the lake through La Fortuna. Don’t miss hiking through the Arenal Volcano National Park before your tour! If you want to kayak through the calm waters of a mangrove forest, look no further than the Damas Island Estuary in Manuel Antonio! It’s a peaceful trip that allows you plenty of time to keep your eye out for monkeys and maybe even pumas! You’ll also see hundreds of tropical birds flying around so don’t forget your camera (and your hat). People don’t just visit Tamarindo for the beach and all inclusive resorts! You can also take an incredible kayaking tour through the mangrove estuary. It’s a great way to spend a few hours in the afternoon and see some amazing wildlife. Lurking in the mangrove waters you’ll spot flying fish, crocodiles, and even sharks! Keep one eye on the tree to spot monkeys and tropical birds! The Estuary begins in Playa Grande and you can walk there from most Tamarindo hotels. Kayaking through Tortuguero National Park will make you think you’re in the Amazon. The maze of canals, mangroves and coves will keep you entertained for hours. Go with a nature guide who can point out wildlife, show you the best spots that a boat couldn’t reach and help you navigate the complex mangrove estuary.